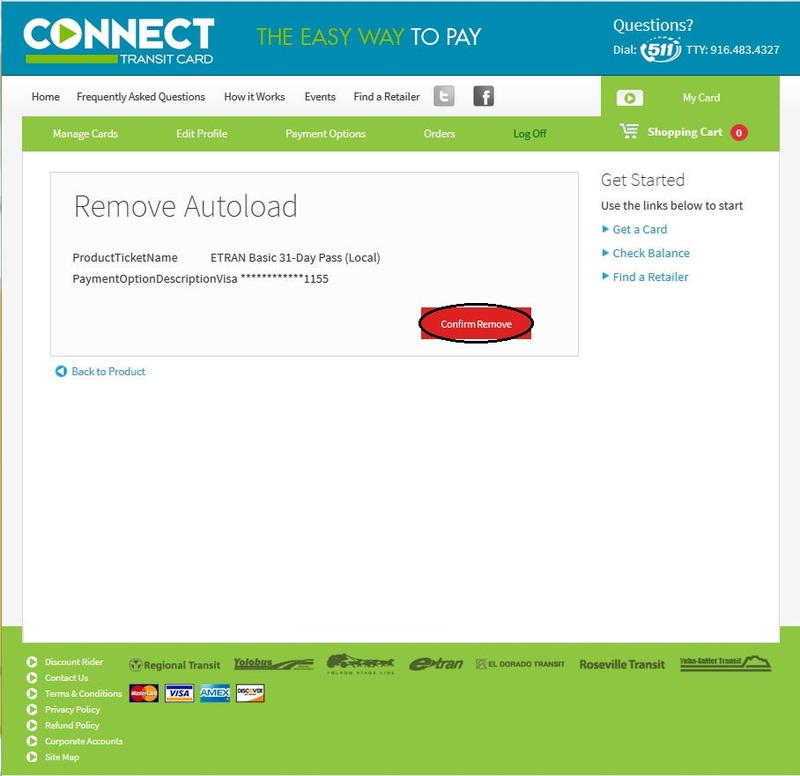 To make paying for your transit fare even more convenient, sign up for the Connect Card Autoload program! 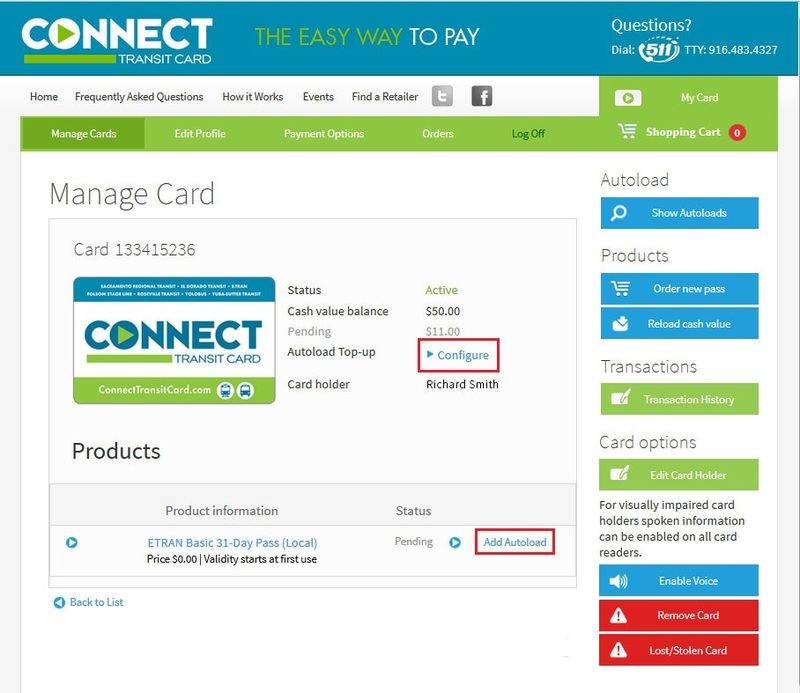 When your Cash Value balance falls below a certain amount (you choose) or your pass is ready to expire, your Connect Card will be automatically loaded with your chosen transit fare from your linked payment option (credit/debit card). What is Required to set up Autoload? How do I Pay for the Autoload? How do I Autoload a Pass? How do I Autoload Cash Value? How do I Edit Autoload Payment Options? How do I Suspend Autoload? How do I Remove Autoload? Autoload offers registered cardholders the benefit of never having to worry about forgetting to buy a pass or not having enough Cash Value to ride transit. With Autoload, your Connect Card can be loaded regularly with your chosen pass before the previous pass expires, and you can Autoload Cash Value whenever your balance falls below a chosen level (Threshold Amount). 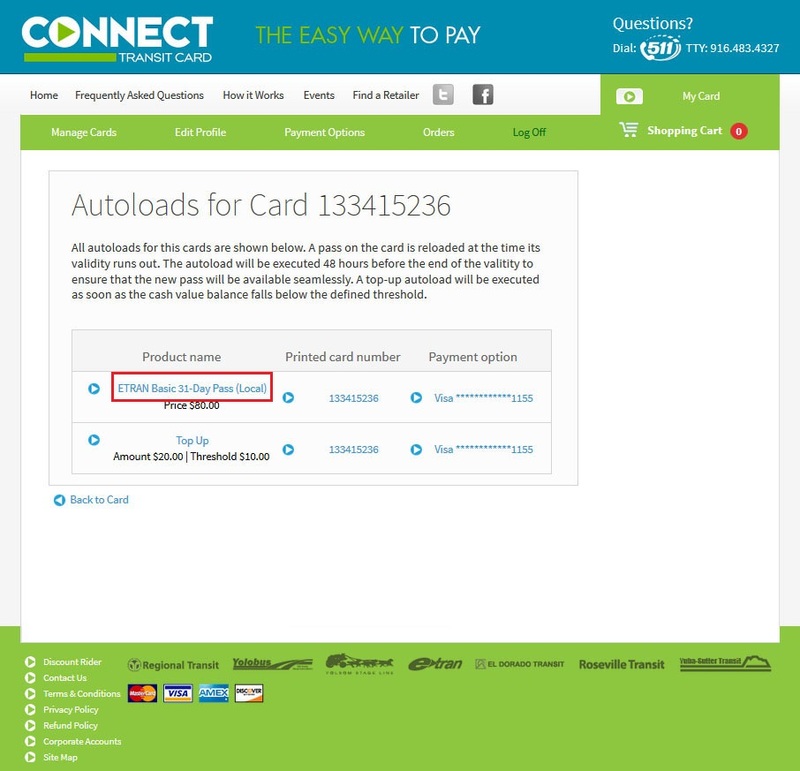 Your Autoloads will be charged to your linked Payment Options (credit/debit card). 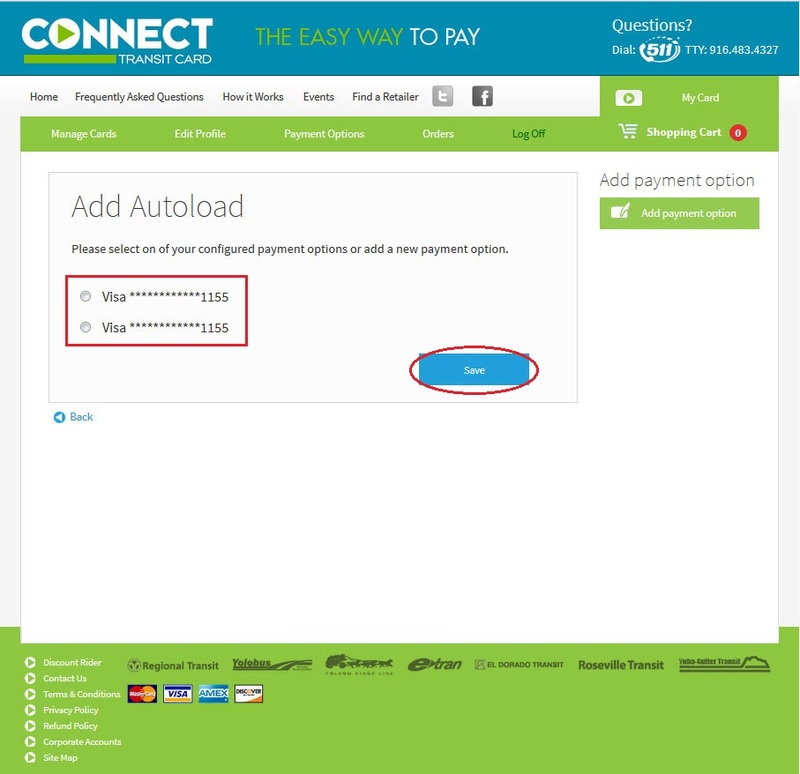 Your stored Payment Option (credit/debit card) will be used to pay for all Autoloads. 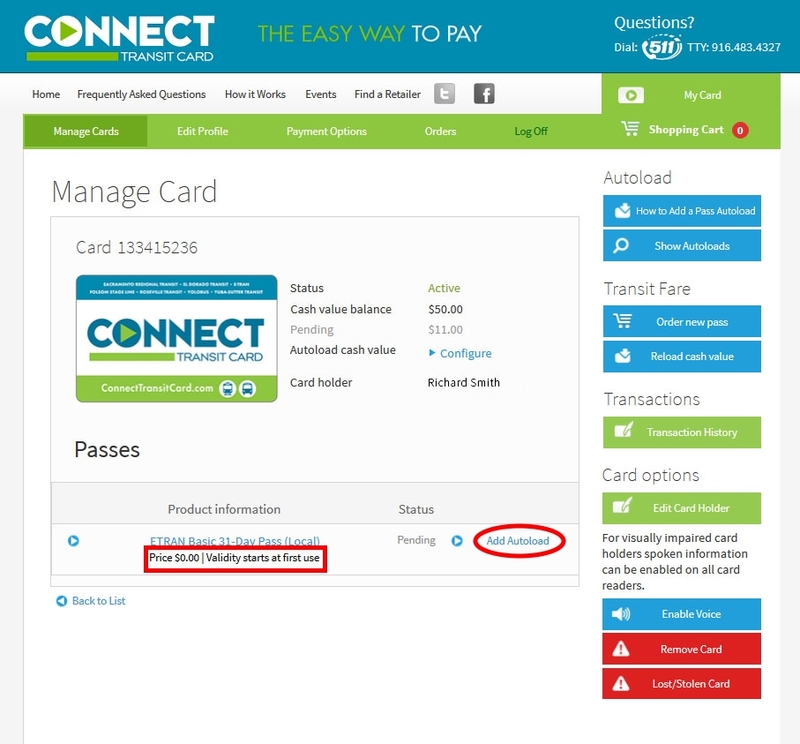 Determine the pass you want to Autoload, and buy that pass for your registered Connect Card. Once you have completed the payment process and linked a Payment Option (credit/debit card) to your account, you are ready to Autoload. 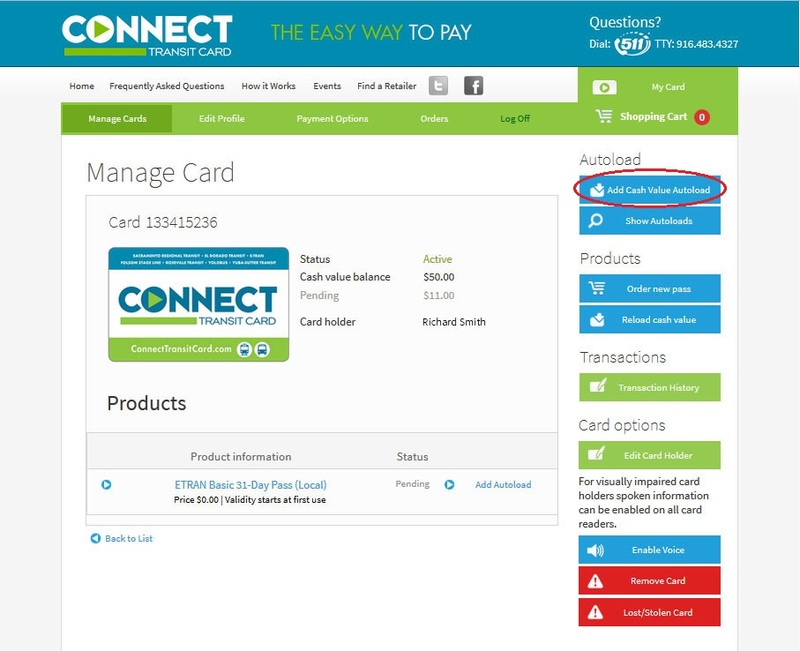 Go to your Manage Cards page to choose the Connect Card you want to set up for Autoload, and select Manage Card. Under the Passes section, identify the pass you want to automatically load to your Connect Card and select Autoload. 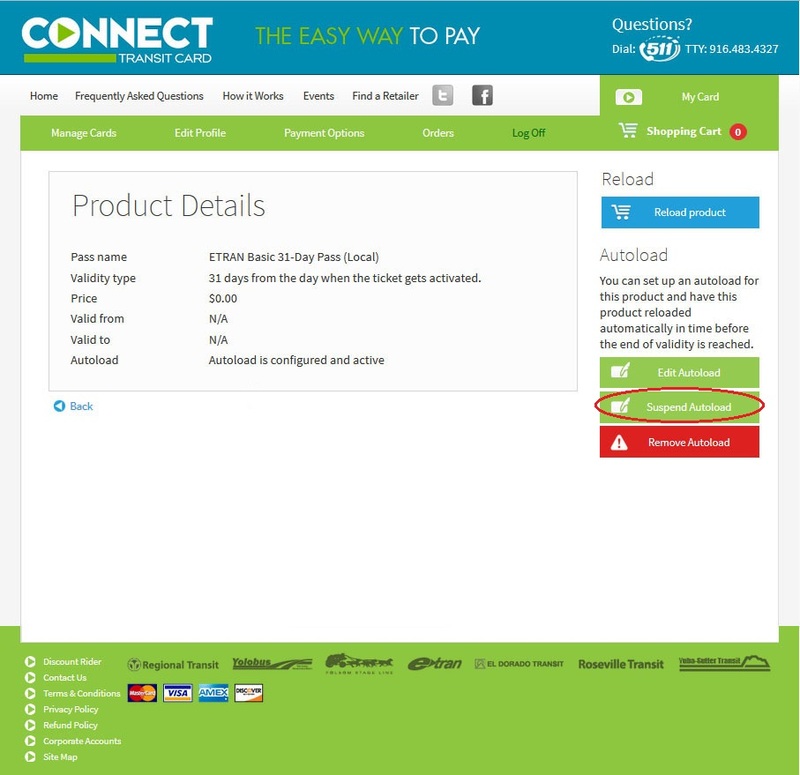 Select the linked Payment Option (credit/debit card) you want to use and click Save. 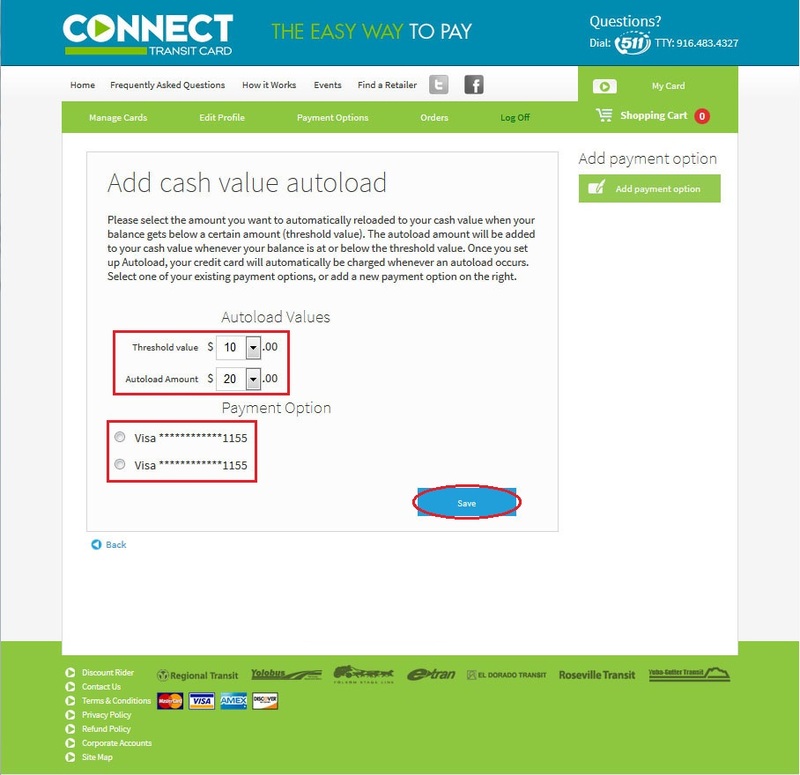 Go to Manage Cards and select the Connect Card you want to set up to Autoload Cash Value. Select the option to Autoload Cash Value. Select the Threshold Value and Autoload Amount, as well as your preferred Payment Option, and click Save. 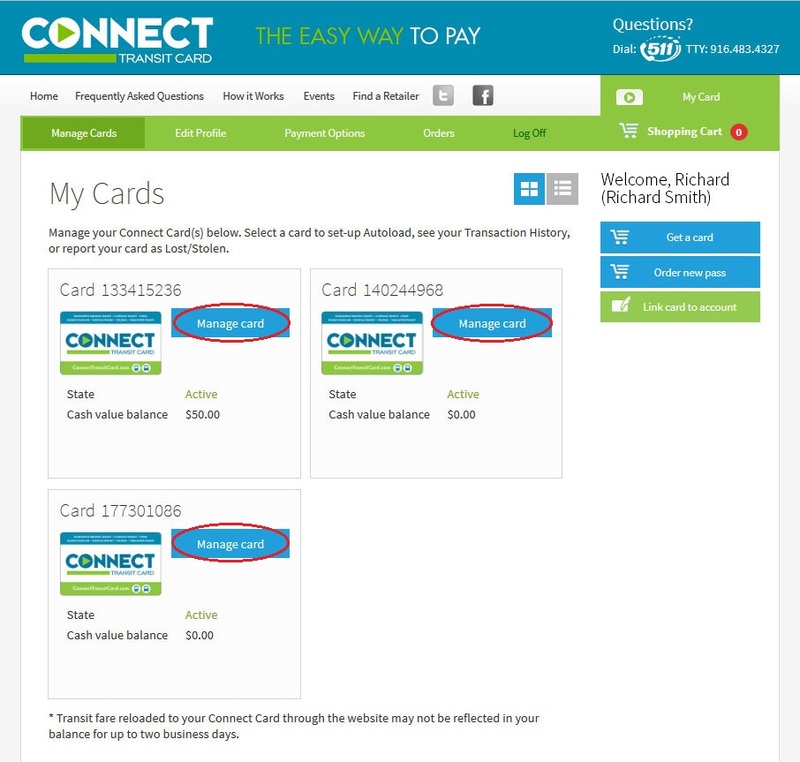 Go to Manage Cards and select the Connect Card you want to set up with Autoload (for passes and/or Cash Value). For Cash Value, select the Edit Autoload link just below your Cash Value balance. For passes, identify the pass you have set up to Autoload, and select Edit Autoload. Select a Payment Option or add a new Payment Option and click Save. 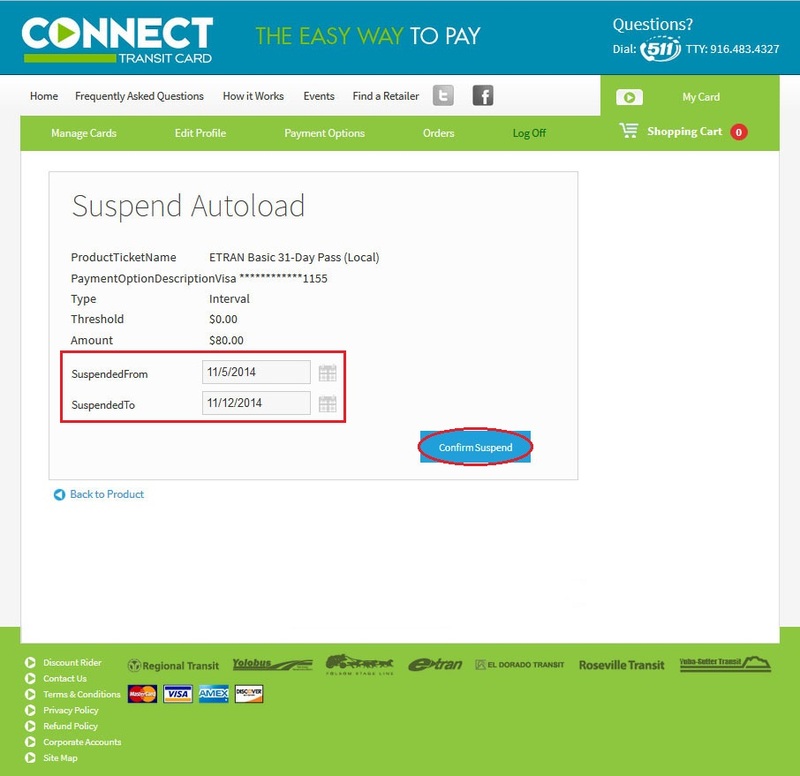 You have the option to temporarily suspend the Autoload feature on your Connect Card. As an example, if you will not be riding transit much of December, you may choose to suspend the Autoload of a Monthly Pass for the month of December. A suspended Autoload can easily and automatically be re-activated on a date of your choice. 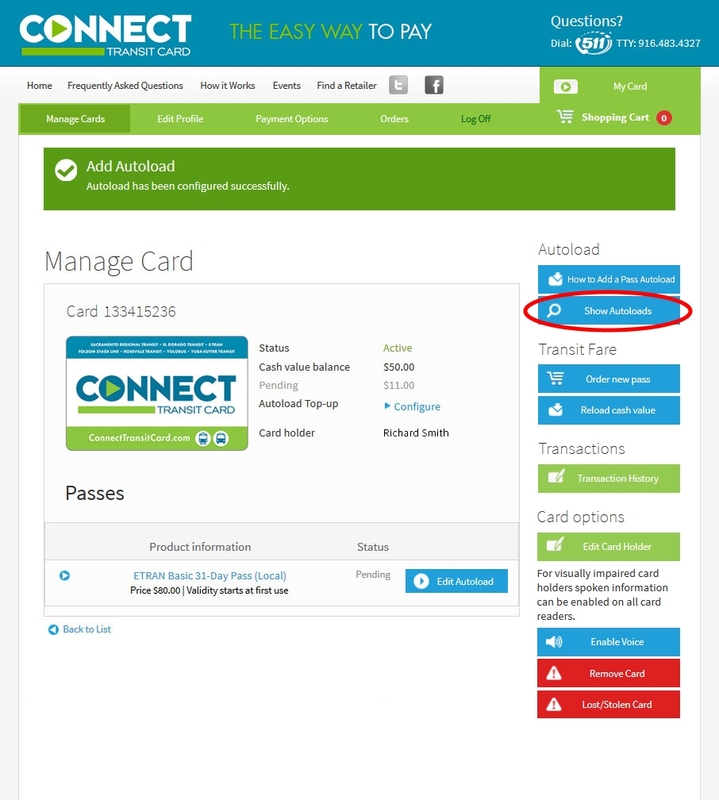 Go to Manage Cards and select the Connect Card with a pass set to Autoload. Within the Pass Details page, select Suspend Autoload. Choose the timeframe you want to suspend your pass from Autoload. As an example, if you will be away for a month and don’t want to a December pass, you would choose to Suspend from 12/1/2015 to 12/31/2015). Then click Confirm Suspend. Go to Manage Cards and select the Connect Card with Autoload set up (for a pass or Cash Value). In the right-hand column, select Show Autoloads. Select the pass or Cash Value you no longer want to Autoload. Within the Transit Fare Details section, select Remove Autoload.